Passport Photo Place is the local Orlando, FL Orange County photo service provider for Indian visa online and mail-in visa applications. 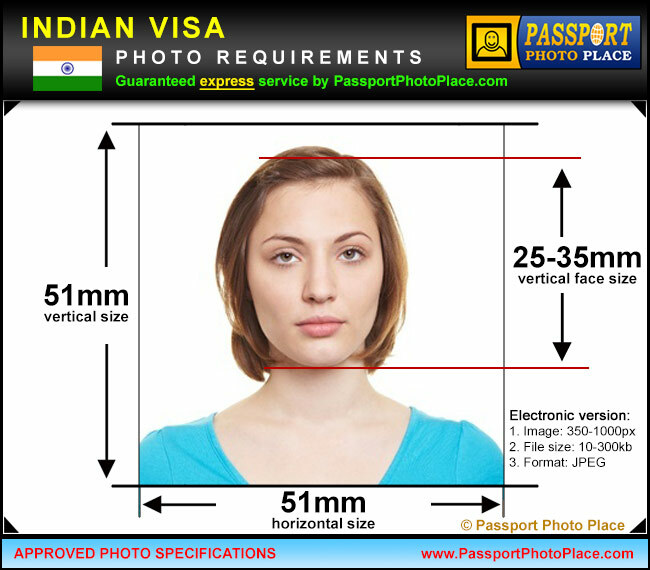 We provide both electronic and printed versions of Indian visa photos for all types of visas. All pictures fully comply with Indian government specifications and are guaranteed. To book a photo session for Indian visa photo service email or call our Orlando, FL Orange County photo studio at 321-236-1105. Indian Embassies and Consulates only accept professionally produced photographs that fully comply to the Indian visa picture requirements as provided for year 2019. The consulates advise to utilize legal photo studios to avoid application rejections and processing delays. Passport Photo Place specializes in legal photo services that are fast and are in complete compliance with the visa photo specifications that are provided by Indian embassies in the United States. Our photo studio offers professional Indian visa picture services for electronic online application using jpeg photo files and mail-in forms using printed photographs. Guaranteed Indian visa photo service. No rejections! All visa photographs are taken and printed by the precise Indian government specifications for year 2019. All photographs for visas are produced by a full-time professional photographer at our studio. Our studio takes and prints photos using the latest in image production technology that fully complies with the official Consulate General of India requirements. Both printed and electronic versions of Indian visa pictures are produced at our Orlando, FL conveniently located photo studio. Visa photographs for India follow the 2019 government requirements as specified below. The photos must present full frontal view of face with eyes open. The background must be white, although light colored backgrounds are accepted as long as they’re not saturated and very light. Only prescription glasses is allowed in the Indian visa pictures and only if the frame is not thick and the glass is fully transparent without tinting. Please wear a solid-colored top/shirt. White or slightly off-white tops are not allowed since the background for Indian visa photographs is white and there must be a good contrast between the subject and background. Our Orlando, FL Orange County legal photo studio is accessible via major routes and is in relatively close proximity from the following cities: Aloma, Altamonte Springs FL, Apopka FL, Apopka, Azalea Park, Belle Isle, Bithlo, Buena Ventura Lakes, Cambell, Casselberry, Casselbery, Celebration Florida, Celebration, Christmas FL, Christmas, Chuluota, Clermont, Cloud FL, Cocoa Beach, Cocoa FL, Cocoa, Conway, Davenport, Doctor Phillips, Eatonville, Edgewood, Fairview Shores, Fairvilla, Fern Park, Forest City, Goldenrod, Gotha, Hiawassee, Holden Heights FL, Hunters Creek, Kissimmee, Lake Buena Vista, Lake Butler, Lakeland, Lockhard, Lockhart, Longwood FL, Maitland, Meadow Woods, Merritt Island and Cocoa Beach, Mims, Narcoossee, Oak Ridge FL, Oakland, Ocoee, Orlando FL, Orlando Florida, Orlando International Airport, Orlando, Orlo vista, Orlovista, Oviedo Florida, Oviedo, Paradise Heights FL, Pine Castle, Pine Hills, Port Saint John, Rosemont FL, Sanford, Sky Lake, South Apopka, St. Cloud, Tildenville, Titusville FL, Titusville, Union Park, University Park FL, Windermere FL, Windermere, Winter Garden FL, Winter Park and Winter Springs.